Supply chains are awesome. At least, they are when they’re running efficiently. Managing your supply chain well reaps plenty of rewards, but it can also be one of the more complex aspects of your business to oversee. Enter SCM software integration. Part of what makes supply chain management so tricky is its widespread nature. Especially when considering a global supply chain, which involves multiple internal departments, not to mention various external trade partners. Not only do you have to deal with a ton of people with varying expertise, but you also have to manage different software systems. Adding to the complexity are situations out of your control — things like cancellations or changes to orders, which aren’t easy to predict since they depend on consumer behavior. Or when warehouse workers call in sick or are no-shows. Even worse is when an entire production facility goes down, bringing your operations to a screeching halt and putting a kink in your neatly planned timeline. Although you may have a great SCM tool to help you optimize your supply chain, the process becomes a whole lot easier with integration. Make no mistake: integrating across your suite of solutions is no picnic. It’s a complex process that takes time and comes with a hefty IT ticket price. But just like Frodo carrying the Ring to Mordor, the reward at the end overshadows the trials of the journey. You have to be willing to invest at the outset to see impact down the road. So, what should you include in your business software integration? Your integration needs to work for you, not against you. Knowing which systems to include will give you a map for success. When considering your SCM integration, picture your operations as a giant puzzle. Which systems naturally lock into the overall framework and contribute in a meaningful way? Those are the ones you’ll want to incorporate. Doing anything else is like leaving out sections of that puzzle — it doesn’t give an accurate, 360-degree picture of your business and how each aspect affects the supply chain as a whole. Enterprise Resource Planning (ERP): These systems provide real-time insights and full visibility into your data. And the centralized, shared nature of ERP means better planning and collaboration — a powerful resource for enhancing your supply chain activities. Warehouse Management System (WMS) and Inventory Management: A WMS is a window into warehouse operations such as receiving, reporting, labor management and pick-and-pack, while inventory management covers the supervision of goods as they flow through supply chain touchpoints. What’s the status of your channel and is it able to meet the demand present? Having these systems working in sync will tell you. Business Intelligence (BI): Supply chains involve lots of moving parts and stages. As such, they produce a staggering amount of data. And data analysis is the home turf of BI tools, meaning you’ll easily be able to make sense of all that raw information. Financial: This includes revenue and operational data, logistical expenses and inventory. With seamless access to claims, costs and other info, the finance departments can operate more efficiently. Customer Relationship Management (CRM): With any supply chain process, you’re ultimately serving customers. Having a seamless interface between your SCM and CRM will make it easier to meet that end goal. Before we look at the multiple areas where an SCM integration will benefit your business, let’s examine challenges you may face along the way. After all, forewarned is forearmed. Inconsistent information. Software integration is like the inner workings of a clock tower — dozens of moving parts. Data acts as the foundation of implementing an SCM integration, so making sure you’re seeing the same info across your systems will keep that foundation from cracking. For example, if the marketing team is planning on running a promotion that will require higher production amounts than usual but doesn’t have access to accurate numbers, the supply chain may not be able to meet the spike in demand. Differences between cloud and on-premise software. You may run into a situation where some systems are housed on your local servers while others live in the cloud. If that’s the case, gain a thorough understanding of how these two storage methods operate and what the key differences are — think security, accessibility, maintenance and more. You need to know that all the systems in your integration will get along. If you need to integrate systems in different environments, iPaaS (integration platform as a service) is a common solution. IPaaS enables software to connect through the use of a toolset that includes features like business rules and connectors. The platform lets you build integration flows so you won’t need middleware or hardware to deploy the integration. Middleware, file loads and error notifications. Middleware allows different software to connect. If your operating system is the ground floor and an installed app is the top floor (or any other floor, really), middleware is the elevator that bridges the gap so data can move from one place to another. If you don’t identify whether a system is using middleware, it may result in extra costs and delays to your integration. File loads come in two forms: full and delta. The difference is how much data you’re downloading. A full load extracts all the data, while a delta load transfers only changed data. Know which format each system prefers. Otherwise, files and info can easily become mismatched. If something goes wrong, how will you know? Error notifications. You need built-in messages that will alert you when an error occurs to ensure you can monitor the systems and know everything is running smoothly at all times. Otherwise, you may face a tangled mess that derails operations. SCM software integration comes with a world of advantages for your operations. Would you say “no” to gaining a deeper level of insight into your organization’s needs and trends? I didn’t think so. With that in mind, here are five benefits of integrating your SCM with other systems. Implementing ERP software is one of the most common integrations companies make. These systems centralize and manage all of your data in one place, allowing seamless data flow across all channels of your business. A good ERP system enables all your integrated systems to share information, meaning you can bid farewell to problems with duplicate and missing data. ERP software also reduces the need for manual data entry. Once you put data into one part of the system, the software automatically shares with others. For example, any shipping data you enter into your supply chain management software is available to your financial software. This helps automate workflows and streamline various processes for your employees, which increases overall production. Another common integration involves BI solutions. These applications provide data analysis, revealing critical insights into your business. Nowhere are these insights more valuable than in the far-reaching supply chain management process. Without analyzation capabilities, it’s tricky to identify the pieces of your supply chain that need improvement. That’s where a BI solution helps out the most. Using your SCM data, the BI tool analyzes each data point and finds the patterns humans can’t. It may discover that certain days of the week correlate with higher shipping costs or reveal snags in the process where delays keep cropping up for transportation modes. With these insights, you can change your shipping schedule so that the expensive day has fewer shipments than others or make transportation adjustments to avoid delays. Use tools to monitor your supply chain and gain insights. BI also plays a central role in demand planning by helping create more accurate demand forecasts. To illustrate, imagine the situation if you produced a thousand computer towers, only to have all but a few hundred sit in the warehouse because people weren’t buying desktop computers at a high rate. Pretty lousy, right? Using BI tools smooths that process by giving you a clearer idea of what the market demand will be for a product, so you don’t end up with too much (or too little) inventory on hand. What’s the effect of your SCM on your customers? Companies overlook that question too often, especially considering predictions that by 2020, customer experience will become the key way brands differentiate themselves from the competition, even over products and price. From owning a quality product to shipping said product on time, the steps in the supply chain highly influence the customer experience. Think of it this way: as a customer yourself, it’s aggravating when a product doesn’t arrive on time or in the condition you expect. The customers you ultimately serve are no different and expect nothing less than the best. Efficiency and convenience rank among the top five values among consumers today. And since three out of every four people you pass on the street consider experience a central factor in choosing which companies to purchase from, it’s in your best interest to prioritize giving them a top-notch experience. Implementing SCM software integrations with your warehouse management system and inventory management system helps you enhance that customer experience. You’ll be able to more effectively manage inventory and control the flow of materials through your warehouses so that the right products arrive on time. As competition intensifies and companies vie for the mental and monetary attention of consumers, you can’t afford to get left behind. From inspection to order fulfillment and everything in between, you need more visibility into every aspect of your product quality. Integrating SCM, WMS and inventory management gives you a single workflow, simplifying analysis and allowing you to focus on finding the supplier and fulfillment providers that deliver the highest quality product. Optimizing your finances often begins with your supply chain. Similar to WMS and inventory management integration, financial software integration provides the benefit of real-time data. Get a full view of your financial data. The best supply chain is an efficient supply chain, particularly when it comes to money. 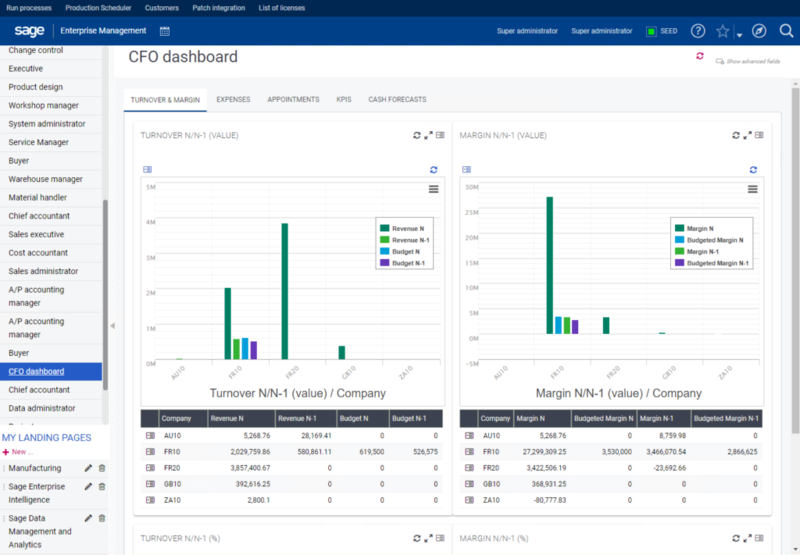 Having a real-time view of your financial data is the best way to ensure it’s efficient, and integration allows the finance department access to documents for activities like calculating costs or processing claims. Armed with this knowledge, you can make well-informed decisions on-the-fly, rather than playing a guessing game. If you start to see a pattern of negative finances in the supply chain, you can correct the problem proactively, rather than reacting after things have gotten out of hand. This limits the damage and saves you money. Want to know your customers better? Integrate your SCM tool with a CRM. Combining your SCM data with a CRM reveals things you may not have previously known about your customers. Your marketers and sales reps can then leverage this information to fulfill your customers’ needs. You can use SCM software to identify your best customers, both concerning purchase frequency and purchase amount. The integration will enable information to automatically flow to your CRM, where your marketers and sales reps can see it. With this information in hand, they can upsell and/or cross-sell to those customers at times they’re most likely to buy. Alternatively, they can offer your customers a discount during their slow buying periods to increase their purchases. 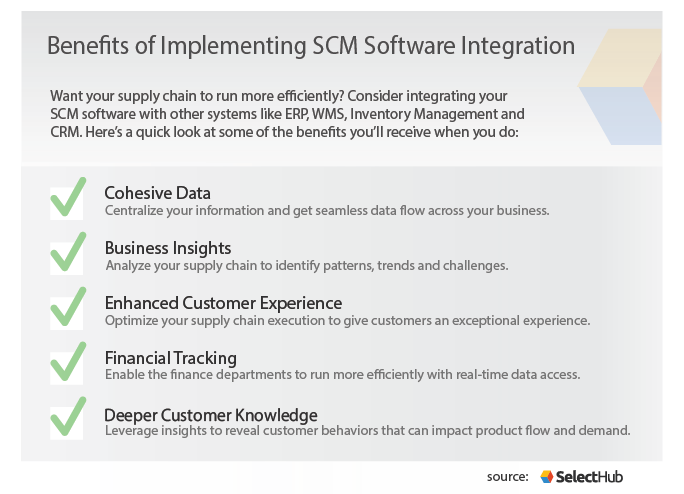 Following SCM software integration, businesses tend to find that their supply chain improves along with other efforts. Although this kind of integration isn’t always easy in the short-term, the value it brings is more than worth it. 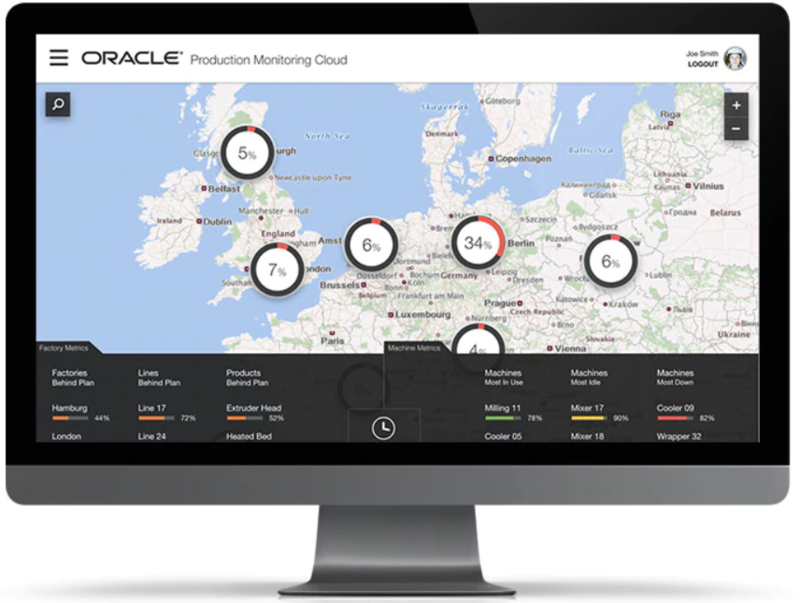 With a complete view of how your supply chain impacts and interacts with other parts of your company, you’ll have seamless access to data from various systems, with analytics tools that give you insights into the details of your operations. In turn, you’ll be able to provide an excellent customer experience, keep track of all your financial information and develop a better understanding of your customers. Before you delve too deeply into planning SCM integrations, be sure to nail down the basics with our free requirements template for SCM software. As companies and industries around the globe become more connected, equip your supply chain to keep pace. Don’t settle for merely squeaking by. Set your supply chain — and your company — up to thrive. What other benefits do you see from integrating your SCM software? Share your thoughts in the comments!